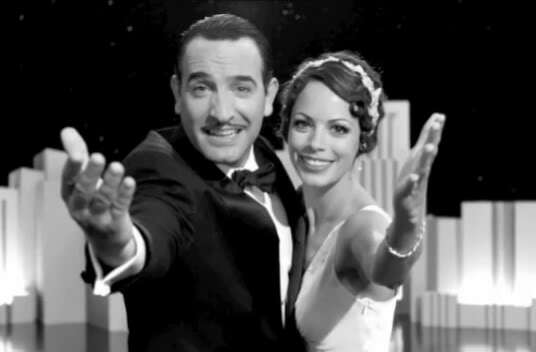 What “The Artist” Taught Us About The Importance of Silent Film. | The Cineaste's Lament. ← Does The World Need A “National Lampoon’s Vacation” Reboot? "The Artist" This year's Golden Globes favorite. If you needed a reminder of the importance of preserving film history, it was driven home by “The Artist’s” big wins during this weekend’s Academy Awards. Writing in The Guardian, film critic Pamela Hutchinson says Michel Hazanavicius’ mostly silent tribute to Hollywood’s first golden age is a reminder that “film preservation doesn’t happen by itself.” When Hollywood switched to sound movies, 80 percent of silent films were lost, Hutchinson notes. This entry was posted in Film News, Golden Age of Cinema, Hollywood and History, Silent Movies and tagged Bereniece Bejo, Jean Dujardin, Mishel Hazanavicius, The Artist, Uggie the dog. Bookmark the permalink.